Vidharth rescued by Indian Army ! 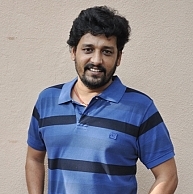 Actor Vidharth of Mynaa fame is currently filming the Tamil remake of acclaimed Hindi film Aamir titled ‘Aalu’. The film is supposedly based on a school teacher in Sikkim who comes to Chennai to reunite with his family but is made to undergo several life-threatening tasks. While filming the portions in Sikkim, Vidharth decided to go for a joy ride on his bike early in the morning all by himself and till about 11 a.m there was no sight of him. The unit began to panic and set out on a search mission with the help of local villagers. After informing the police they were able to track down Vidharth at the Chinese check-post. Vidharth had inadvertently crossed the Indo-China border and was apprehended by the Chinese army. Having trouble communicating with the Chinese officials, Vidharth struggled to explain his innocence. It was later with the intervention by the Indian Army forces that he was released. Vidharth was supposedly distraught by the series of events and the shooting had to be cancelled for the day. Why Does Amala Paul Believe That 2013 Is Her Year? What Is The Myna Star Doing?